Did you ever hear someone say that male turkeys only respond to calls in the springtime? If you have, now is the time to put that myth to rest. Toms don’t just gobble at one time of year, they gobble during the fall, too. Sometimes, in fact, they can be more vocal at this time of the year. It might come as a surprise to many springtime hunters, but it is entirely true. If you’re planning on bird hunting in Michigan during the fall season, it’s your job to get the gobblers excited. As you know, when a gobbler’s excited, he’ll make mistakes, and that’s when he is at his easiest. In order to excite a gobbler, you’ll need to sound like one. You’ll need to imitate a newcomer who is trying to challenge the older males. Here’s your guide to calling fall turkeys to help you to enjoy maximum success. You need to find your gobbler first before you can call it. The game birds of Michigan are more driven by food during the fall than their drive to reproduce. Therefore, finding gobblers by scouting sources of food is your best bet. Hawthorn, wild grapes, dogwood, crab apples, and persimmons are all popular food sources during this season. Other food sources are seeds, insects, cherries, grasses, beans, grains, and clover. When you’ve found their food sources, you can find their roosting sites. These are the first places to begin the hunt. It’s hard to tell the difference between toms and hens. All turkeys make the same putting, cutting, and purring sounds. Nevertheless, there is one telltale giveaway – the rhythm. A hen’s note is shorter in length and faster than that of the male. Gobblers, meanwhile, have notes that are slower in rhythm and more drawn out. They’re also often more throaty or coarse than hens. Fall turkeys respond well to quality glass or slate calls. When you are Michigan bird hunting for turkeys, you should remember calling, social status, and pecking order are all vital. This is especially true if you want to be successful. Calling to individual birds is essential if you are going to bring turkeys in. Yelping – Try to match the pitch and volume of your chosen gobbler. Add a little emotion, then listen for a response. Purring – As you would in springtime, you can use purring to put a nervous bird at ease. Cutting/putting – If you cut at fall gobblers with a sense of attitude, they will become excited and think you’re challenging them. Lost yelp – One way to get a response from even silent turkeys is to try to imitate a brood hen. You can do this by making a plaintive yelp around 10 or 15 times. Learning the right calls to try to attract turkeys during the fall is essential to your success in the field. Many people mistakenly think there is little point in heading out on a hunt at this time of year. In fact, it can be one of the most rewarding times to bring in a tom. If you’re excited to try out your newly learned fall calls, contact us today at Pine Hill Sportsman’s Club. We are also one of the top Michigan pheasant farms. We offer outstanding upland bird shooting opportunities for hunters of all abilities. Heading out on the hunt with friends, family or as a corporate event? 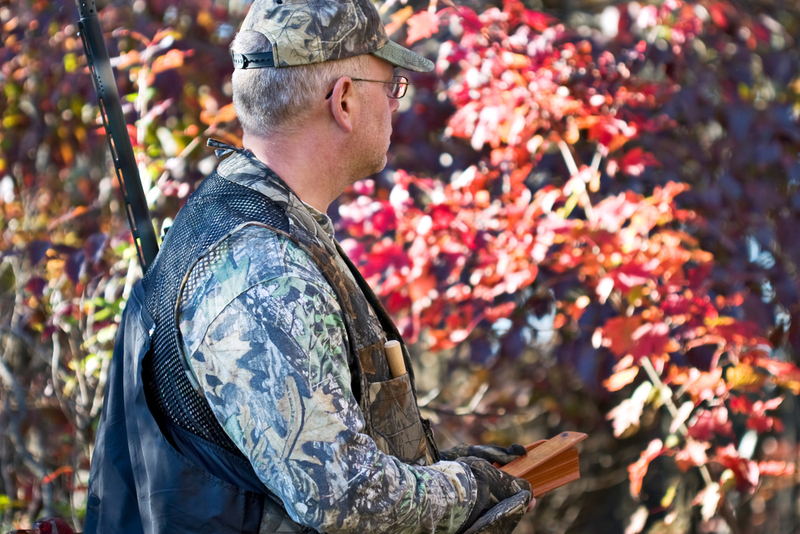 Make us your first choice for turkey shooting and, make the most of the fall season. Successful Turkey Hunt at Pine Hill!